The sad news reached me of the passing away of one of my seminal influences and one of bodybuilding's true legends, Wag Bennett last week. Wag ran a bodybuilding gym in East London for around 50 years. He won some early bodybuilding titles, became the first person in Britain to bench press 500 lbs, (when he only weighed 150 lbs!! ), in 1951, and was the President of the English Federation of Bodybuilders. Wag inspired many people with his willingness to share his vast knowledge and passion for bodybuilding and strength training. We would sit for ages after my workout talking. He'd share dozen of stories of the bodybuilding legends he knew and trained. He was a fountain of knowledge and shared it willingly. One of those bodybuilders was Arnold Schwartzenegger. When 'Arnie' was 19, he came to London. He met up with Wag who soon spotted his huge potential. Wag (and his wife Dianne), took Arnold into their home and Wag set about training (and feeding and housing), the young Austrian. Wag taught Arnold to pose for competitions, and introduced the idea of posing to music, which they pioneered together. Wag is on the left here. As a skinny (8 and a half stone), 15 year old, back in the late 70's, I tentatively, and nervously stuck my head around the door of Wag's gym, to be greeted with a warm welcoming smile from Wag, and his gym manager Nick (Jeremiah) Tyler. "So you want to build some muscles eh?, well you've come to the right place lad", was the response I got. Nick set about writing me a beginner's routine and Wag began teaching me the basics of good exercise form, nutrition, sleeping, and positive thinking....what a revelation to a young mind. One day Wag announced that Arnold would give a seminar in the gym. We sat about the benches and on the floor agog, listening to the most positive thinking human being I'd ever met. I left that seminar believing that almost anything was possible to achieve. Clearly that drive remains with him to this day. This influence got me to change my scrawny body into an 11 stone athletic, strong physique within a few months, gave me the confidence I lacked previously, and taught me about the power of positive thoughts. I developed an interest in other sports, like boxing, fencing, martial arts, canoeing, running and climbing. A new life opened up before me. Some years later I got very carried away and rose to 14 stone 10 lbs with 16 3/4 inch biceps, squatting over 400 lbs and benching over 350 lbs in training. This was bodybuilding the old fashioned way, 18 eggs a day washed down with 4 pints of milk. Protein drinks, chicken and enough vitamins to sink a boat. Training so hard you couldn't walk home in a straight line. Contributing to more ozone damage than a field full of cows!!! Without Wag's seminal influence, kindness, training, positive attitude and that gym, I would never have joined UK Special Forces, never have had the life of adventurous sports which I've enjoyed, and would never have become a Stuntman and Stunt Coordinator. I owe a great deal to the man who helped so many to live a stronger, healthier, fitter and more positive life. I'll miss popping into his old gym for the odd workout, and I'll miss sitting with him afterwards, telling him stories of my stunt exploits, which he always asked about. 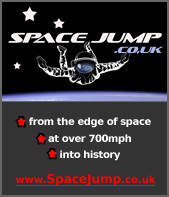 Just about everything is now in place to perform the jump as soon as the last bit of sponsorship is in. The spacesuit is in great shape and passed all it's basic tests at the American company that makes suits for NASA. It will undergo the final proof pressure tests as soon as we start the battery of pre launch testing. The specially 'designed for purpose' parachute rig is now with me, as is the spacesuit. Launch site(s) have been established and permissions are to be sought shortly. A slight delay in the Life Support System has meant a switch to an alternative supplier who supply the NASA systems. They will be building a special system for my suit. We have put the documentary on hold until the funds are in and will start filming shortly after that occurs. The French team now have to wait until next May, and it seems unlikely they will launch even then. This gives us a comfortable breathing space of at least eight months. With no other serious attempts out there, things are looking great and we can still launch this year or early 2009. To answer the many questions regarding the spacesuit, balloon, scientific team, launch crew and strategy, please be patient. You may have noticed a couple of people who jumped on the 'I'll have a go at that' bandwagon, with clearly no idea of what something like this entails, and without the skills or background, (one isn't even a skydiver!!). For this reason, and because there is still a serious threat from the French, my team and scientific support are not being publicised. They are an incredible group of world leading specialists and will be fully credited and revealed in the book and documentary. The photo below was taken at the headquarters of the US spacesuit company who have helped me so much, and will be rebuilding the suit after the test jumps, ready for the big one. This is a current NASA suit which they manufacture. It's been a long road; 15 years of research and planning, 24 years of parachuting and extreme sports experience and 12 years of specialist stunts and risk assessing .... and we could be launching in a few months. Exciting times indeed.